Eric Ruth's 8-Bit version of Activision's DJ Hero is now available to download and play, complete with six chiptune mashups that put DJ Hero 2's soundtrack to shame. Who's up for some Dead or Alive Vs. Siouxsie and the Banshees? Eric Ruth is making a habit of creating 8-bit de-makes of popular modern games. He's the man behind Pixel Force: Left 4 Dead after all, and now he's finally released Pixel Force: DJ Hero, and it's pretty damn amazing. 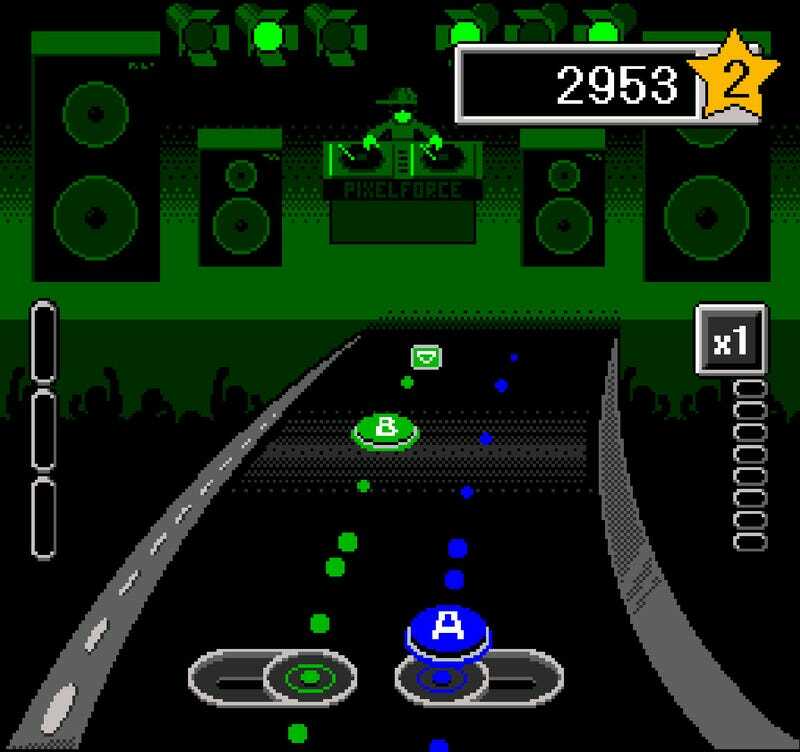 When we first heard about Pixel Force: DJ Hero, Eric had three mashups lined up for the release: Queen's "We Will Rock You" and Joan Jett's "I Love Rock & Roll", Ray Parker Jr's "Ghostbusters"/Huey Lewis & the News' "I Want A New Drug", and Kenny Loggins' "Footloose"/Peter Gabriel's "Big Time". The Loggins/Gabriel mix didn't make it into the final version, but now we can add Dead or Alive's "You Spin Me Round (Like a Record)" and Siouxsie and the Banshees' "Peekaboo", ABC's "Look of Love" with Nu Shooz's "I Can't Wait", Madonna's "Into the Groove" with Michael Jackson's "Thriller", and the Dominos' "Layla" with INXS' "Need you Tonight." If that's not the best video game soundtrack of all time, then you and I don't share opinions, which happens a lot. Pixel Force: DJ Hero is now available for free download at Eric Ruth Games.